QUEENS — It’s a ‘farm-to-air’ concept. In an effort to beautify JFK and to educate travelers about farming, JetBlue Airways is opening its own farm, just outside Terminal 5. The 24,000-square-foot farm will feature 3,000 crates of blue potato plants as well as 2,000 herbs and a variety of produce like arugula, beets, mint and basil. 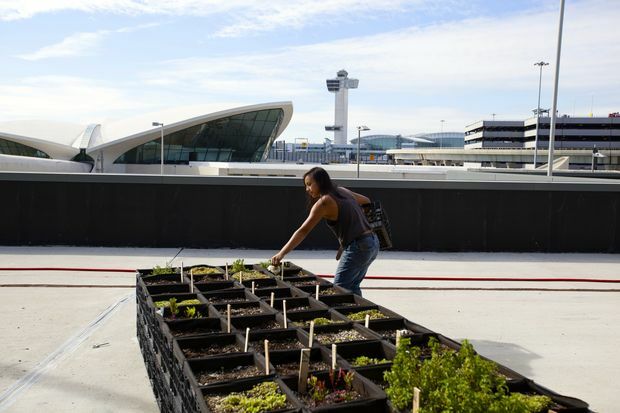 “An airport seems like an unexpected place for a farming experiment, but what better way to explore our role in the food cycle than to harvest right in our own back yard at JFK,” said Sophia Mendelsohn, the airline’s head of sustainability, in a statement. The project faced a number of challenges, as the airport was concerned about attracting wildlife. It took the airline three years to get approval for the farm and the plants that were eventually selected have the ability to deter birds and other animals from coming to the area, JetBlue said. Created with support from GrowNYC Partners, a nonprofit that promotes local agriculture, and in a partnership with chips producer Terra, the farm is expected to grow more than 1,000 pounds of blue potatoes per harvest, according to JetBlue. Eventually, the airline hopes to use some of the blue potatoes from the T5 Farm to make Terra Blues chips served during flights. The airline is also planning to donate some of the herbs and produce to local food pantries as well as use them at several T5 restaurants. The farm won't be open to the public at first, but in the future it will be used for educational programs, JetBlue said, including workshops about farming for local students. “It’s an opportunity for us to educate all the travelers about where food comes from in an exciting, non-traditional setting,” said GrowNYC Partners executive director Marcel Van Ooyen in a statement.